Note: This article has been written by Philip J Reed on behalf of DexOne, creating small business marketing solutions. We all know about the importance of public speaking, but did you know that people size you up from the moment they see you? It’s not about being judgmental — at least not on purpose (in most cases). It’s just human nature to read the environment. In “5 Ways To Make A Killer First Impression”, Vanessa Van Patten, Author of “Human Lie Detection And Body Language 101” referenced Princeton research in which people watched a video of political candidates for a microsecond and then they were asked to predict who would win the election. The subjects had a 70% accuracy rate. As a result Van Patten says, “People can make incredibly accurate snap judgments in a tenth of a second.” And if your audience is deciding that quick, then it’s important to make the most of your time with them. Here are a few tips to help you “say” what really matters with your look, body language and conversation before you start your next speech. What’s in your head is ultimately the most important information about you. But in most settings people have to go two layers deep before “hearing” what you have to say in conversation. First comes your look, followed by body language, and conversation is usually third on the list. Since your style does matter and is often the first part of the equation that an audience tries to solve when listening to a speaker for the first time, take a few minutes to get this right. “Make sure that what you’re wearing and how you do your hair or make-up says what you want it to say to the people you’re meeting for the first time,” says Van Patten. For example, nails need to be clean and well groomed so that they don’t take away from your overall message. Style is always a matter of degrees, and you’re working to strike a balance. Clothes should reflect your personality and respect the environment. And get the hygiene right, because body odor, bad breath and too much perfume/cologne can kill the best fashion statement. When it comes to looking your best, get it straight in the quiet of your home and then forget about it so that you can focus on the rest of the conversation. MindTools says, “When…making the first impression, body language…speaks much louder than words.” Again, people are going to listen to your body’s conversation before they get to hear you say a sentence. So take Whitson Gordon’s advice in “How to Make (and Sustain) a Good First Impression Every Time”, “Smile. Try to keep from fidgeting. Adopt an “open” posture—that means no crossed arms or crossed legs.” When you are greeting people before your speech, get the handshake right. According to LifeHacker “the handshake, is one of the oldest, most common social customs on the planet, and a key factor in many first impressions.” ABC News reported that Chevrolet commissioned Professor Geoffrey Beattie, Head of Psychological Sciences at the University of Manchester, to create a handshake guide for their British sales men and women. 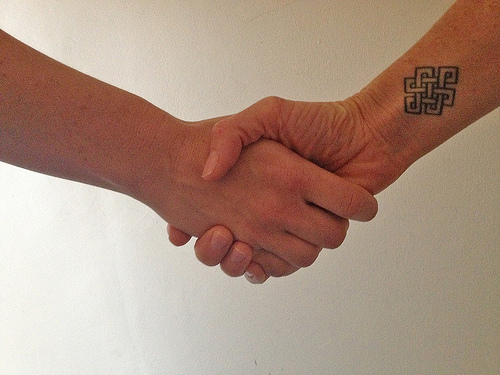 And Professor Beattie says there is such a thing as the perfect handshake. Lifehacker suggests that you “use their name.” By doing so it demonstrates a level of focus and respect. The lifestyle website also suggests that you “don’t talk about yourself too much.” Ask questions about them so that your audience gets to talk as well. After all, conversation is supposed to be give and take by design. First impressions matter — make it count. Question For You: What do you think the best way to research how you can make the best first impression is for a given audience?